During my pilgrimage to the Holy Land in September, I had the opportunity to spend time at the Monastery of St. Saba in the Judaean Desert. 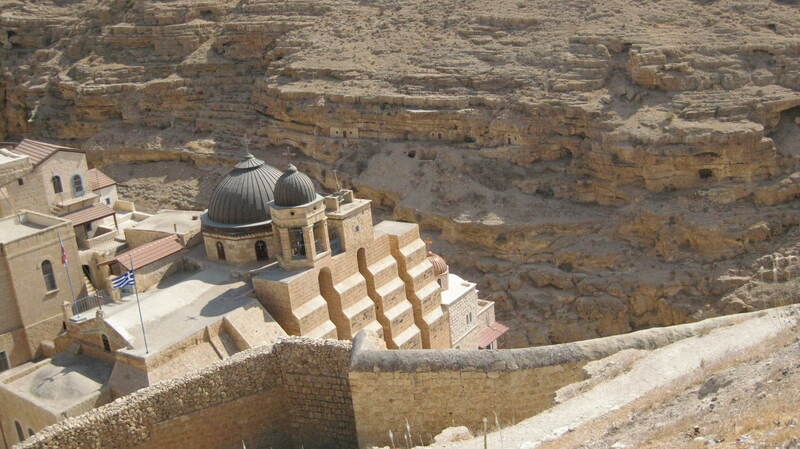 Clinging to cliffs overlooking the Valley of Jezreel, it is the oldest continually-functioning monastery in the Orthodox world. It is hot (particularly in the summer), and even the caves give little relief during the day. There have been many great monastics and martyrs who have lived in this monastery of the centuries. 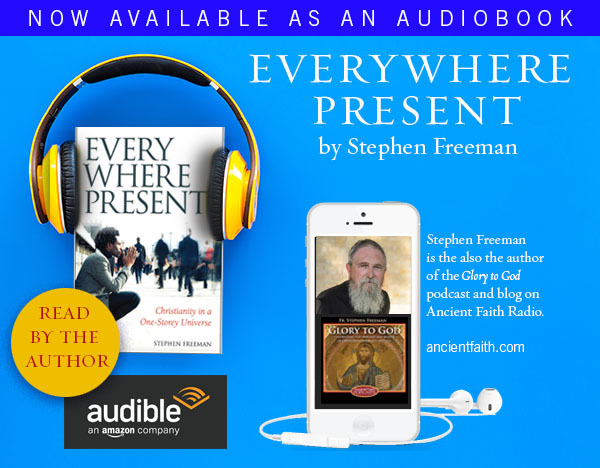 It’s founder, St. Sava, is among the greatest of the desert dwellers. It was in this monastery that the original “typicon” (book directing the details of services and feasts, etc.) was written and still has dominance in much of the Orthodox Church. 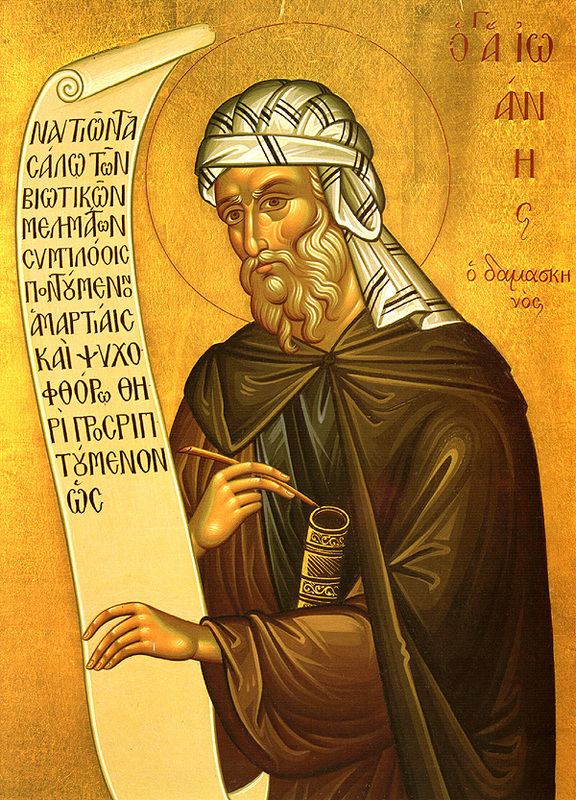 Among its many famous inhabitants was the great Church Father, St. John of Damascus. Today is his feastday. I had the privilege while at St. Saba’s to visit in the cave of St. John, to ask his prayers, and to consider his way of life. There is not much to be done to make a cave comfortable. It is, after all, a cave. There was a ledge of rock upon which he slept. I do not know what he may have used for a “mattress.” Some monastics at the time used nothing more than a mat of reeds. There was a small niche in the wall for a candle and his icons. There was another niche to serve as a desk, for it was here that he did his greatest writing. Perhaps the most complete summary of the Orthodox faith (as of the 8th century) is St. John’s Exact Exposition of the Orthodox Faith. He had earlier wrote one of the major works defending the making and veneration of icons – still one of the finest treatises on the subject. He was a major writer of hymns for the Church, including a large body of hymnography that is used today at funerals. It would be easy to write a detail treatise of his life. For more information, I suggest the following site. Of greater interest to me is sitting in the cave. St. John was not alone at the monastery. There were hundreds of monks in his day (today there are 15, though it is growing). The cliff opposite the present monastery, is pock-marked with the earliest caves of these desert dwellers. On the other hand, I know how difficult it is to pray in my office or my car or with a television beckoning, etc. Comfort is not always conducive to prayer. We have designed our lives around our comfort and not around our prayers. I am also aware that my heart looks more like my living room than it does St. John’s cave. It is full of distractions. Thus when the admonition comes to “enter the heart,” it is all too often an entering of just another room, just another place not to pray. Caves are hard to find in our world. The emptiest room I can find in my world is the existential emptiness of my own being. It is the hollow sound of death that stalks my body and the meaninglessness of contemporary consumerism. It is the fear of failure and the non-being of lies. It is the ugliness of my judgments and silliness of my pride. I cried unto the LORD with my voice; with my voice unto the LORD did I make my supplication. I poured out my complaint before him; I shewed before him my trouble. When my spirit was overwhelmed within me, then thou knewest my path. In the way wherein I walked have they privily laid a snare for me. I looked on my right hand, and beheld, but there was no man that would know me: refuge failed me; no man cared for my soul. I cried unto thee, O LORD: I said, Thou art my refuge and my portion in the land of the living. Attend unto my cry; for I am brought very low: deliver me from my persecutors; for they are stronger than I. Bring my soul out of prison, that I may praise thy name: the righteous shall compass me about; for thou shalt deal bountifully with me. Hear my prayer, O LORD, give ear to my supplications: in thy faithfulness answer me, and in thy righteousness. And enter not into judgment with thy servant: for in thy sight shall no man living be justified. For the enemy hath persecuted my soul; he hath smitten my life down to the ground; he hath made me to dwell in darkness, as those that have been long dead. Therefore is my spirit overwhelmed within me; my heart within me is desolate. I remember the days of old; I meditate on all thy works; I muse on the work of thy hands. I stretch forth my hands unto thee: my soul thirsteth after thee, as a thirsty land. Selah. Hear me speedily, O LORD: my spirit faileth: hide not thy face from me, lest I be like unto them that go down into the pit. Cause me to hear thy lovingkindness in the morning; for in thee do I trust: cause me to know the way wherein I should walk; for I lift up my soul unto thee. Deliver me, O LORD, from mine enemies: I flee unto thee to hide me. Teach me to do thy will; for thou art my God: thy spirit is good; lead me into the land of uprightness. Quicken me, O LORD, for thy name’s sake: for thy righteousness’ sake bring my soul out of trouble. And of thy mercy cut off mine enemies, and destroy all them that afflict my soul: for I am thy servant. Oh, this has helped me. Don’t we all have this very place within us, when we are willing to go there? ‘Keep thy mind in hell, and despair not ‘ said St. Silouan the Athonite. Father, is it sinful to fear failure? What about failure to fulfill one’s duties? Dear AR, Father will correct me, but my own conviction is that nothing good comes from that kind of fear if it is not accompanied by a faith in God’s mercy that is far stronger than the fear. Otherwise, it only leads to despair, not theosis. Gleamed with light upon all things. Intercede before Christ God to save our souls! I never think in legal terms as far as sin goes – far more on its effect on the core of my being and my heart. I suspect that fear of failure is counterproductive, since we will fail. I do not want to fail God, but I know that I will. It is not to give me an excuse not to try, but God isn’t keeping score, He’s healing my heart. We are often raised with rewards for success and punishment for failure, including, tragically, emotional rewards and punishments. I think I became pretty solidly neurotic when I was in college worrying about grades. It drove me crazy and was harmful. Take the specifics to your priest. I think sometimes this perfectionism can invade our life of prayer and our fasting where it also is counterproductive. The failure in fasting is not to be found in eating incorrectly, but in the failure to repent in our heart. We can keep the fast perfectly, but without a broken heart it does us no good. Sometimes failure can break our heart – in such a case it is a very good thing. Indeed I suggest to people if the fast they keep isn’t a little out of their reach, so that they will fail at least a little, then it may do them harm. We should hear (at the end of the Lenten fast) the kind words of St. John Chrysostom as great good news. The righteous and the perfect are the only ones who would not enjoy that sermon. A few more thoughts on fear of failure (a.k.a. perfectionism). In both being made in God’s image and at the same time fallen from His likeness, I find there is often an exceedingly thin line between legitimate (healthy, natural in the positive sense) human needs arising from the limitations inherent in God’s design of us and in the fallen inclinations we all have to satisfy those legitimate or healthy needs in distorted, sick and sinful ways. 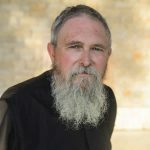 Tangentially, it is always impossible to embrace the sinner in a truly meaningful way as God calls us to do without somehow also making room in that embrace for their sin as well. This necessarily includes our embrace of our own humanity in spite of the sin only God can cleanse us from. I have often been frustrated by a rhetoric of “embrace the sinner, not the sin,” that is wholly without an accompanying meaningful concrete expression of that for my context. This inevitably happens where there is some variation of Christian fundamentalist or “Pharisaical” mindset at play (often in exceedingly subtle and covert ways), while the rhetoric of the gospel is at the same time “perfectly” preached (as abstract theory) from the pulpit! This can take as many forms as there are religious contexts (of course, Orthodoxy, with which I identify myself, being no exception). I am convinced that Christians who limit the import of Jesus’ interactions with the Pharisees to a specifically first century Jewish form of graceless legalism have entirely missed their true spiritual import. I always have to ask myself, how am I failing to recognize Christ (in another human being) because I am so committed to being faithful to the religious lifestyle or rule or doctrine to which I believe God has called me (without the appropriate deeper heart understanding that the fullness of any expression of the gospel is Christ Himself in His full embrace of our humanity, even in its corrupted state? I have often heard preachers say that “love” without truth is not real love–and that is true. I don’t think I have heard the complementary truth taught with anywhere near the same clarity (except perhaps at this site! )–that any expression of Christian “truth” (as abstract theory) spoken into a concrete context without real personal understanding and solidarity (humility) and a meaningful expression of genuine empathy (compassion), is not fully truth either. In truth, none of us are very “qualified” to do very much at all without God’s help (without Him, we wouldn’t be able to so much as offer so much as a single “amen”). What helped me face up to the world (and my own weaknesses in it) was the knowledge that what makes us unholy in the sight of a Holy God, is what comes out of our hearts and mouths. Evil cannot bear fruit if we do not cooperate with it. I know I’ve only offered a small response to the many questions you raise here, but I hope and pray you find all the answers you are looking for. “The emptiest room I can find in my world is the existential emptiness of my own being. It is the hollow sound of death that stalks my body and the meaninglessness of contemporary consumerism. It is the fear of failure and the non-being of lies. It is the ugliness of my judgments and silliness of my pride. Esp. the part about one’s own emptiness? and how does this correspond to the part of us that is made in the image of God? Also, could you write on how we, who are living in affluent North America, can avoid having our comfort kill our spiritual lives? May the uncreated light of God enlighten all who walk in darkness. I am writing from my experience, but as I understand it particularly in the writings of St. Silouan and the Elder Sophrony. There is a mystery in our sinfulness – our “existential emptiness.” The mystery is that “God made Him to be sin who knew no sin that we might become the righteousness of God” (2 Cor. 5:21). In my experience, if I had to wait for a “righteous” moment, I could never pray (such moments are too few). The Pharisee prayed in his righteousness and was not justified, while the Publican would not even lift his eyes to God and only sought mercy and he was justified. Comfort will kill our spiritual lives if we try to make it our home (we flee there to avoid the discomfort of our brokenness and sin). Instead of fleeing, we can learn to pray where we are, even if our “cave” is populated by all the various temptations and failures of our world and our lives. Christ will not turn away from us – He came to find us even in Hades. I pray with John (in the comment) that the uncreated light of God would enlighten us all. However, I have only known a few who have seen the uncreated light. However, I have known no one who has not been in the dark. I did not know when I became Orthodox why/the ultimate end/reason but I am beginning to see it is because I need to understand how to live because of Pasca. When I was a Protestant I did not realize this. I still remember your advice to pray the “Lord let me greet this day in peace” prayer as part of living the reality of Pasca. It is the last prayer in the morning prayers of my little prayer book from my church! Thank you again for your encouraging words! Steve, thanks. With regard to your first point, speaking as a recovering perfectionist, I’ve often been very comforted by Jesus’ teaching about His being the Vine and we the branches in John 15. In a similar way the Eucharist as Orthodoxy understands it to be comforts me. I must take the initiative to willingly prepare for the requirements to approach the Chalice (and all those steps are simple and possible for anyone who is willing to do so at whatever level their faith rests, not that this is always easy). Even here, God is the One Who grants grace for repentance and faith and Who even woos our will (though without forcing or violating its true freedom). Yet once I open my mouth and the Holy Body and Blood of my Lord enter and are swallowed. I make no further conscious effort of cooperation with this “medicine of immortality,” yet this is where it (or rather, He) actually begins to do its powerful work of transformation in me–this communion with the whole Person of Christ. The Eucharist helps me to understand experientially (not primarily rationally) that coming to Christ in any kind of prayer and where He meets me in all my experiences must be with this same humility and faith if I am to experience the grace and union with Him that I seek. It must even inform my approach to the study of the Scriptures, which engages much more involvement of my conscious and rational processes. Dealing with this tension in relationships with others who are dealing with the same tensions only adds to the challenges of developing discernment about the nature of what is truly within one’s own or another’s heart! A spiritual perfectionist wants a degree of certainty about that where only faithfulness and true humility and teachableness and a willingness to forgive and be forgiven will really serve. I still get hung up and paralyzed, spiritually immobilized in this tension, far longer than I would like (or that I feel is good for those whose well-being depends in some small part on me). Naturally, this is a real hindrance to healthy intimacy (communion) in horizontal relationships, just as it is with God, and as we know, the two are always connected. Your statements about holiness of heart and lips and not cooperating with evil are so very true. My personal struggle not to cooperate with evil (which can be so very wily and always cloaking itself in garments of light! )–whether in another or in my own heart–and trying to flesh out what that can look like for me as I am on this journey with the Lord was at the crux of my earlier comments. These are not questions for which there are any easy (in the sense of easy to do) answers. Though I voice the questions because I find it to be helpful to process what the Holy Spirit seems to be churning up within me in dialogue with others, and others sometimes are benefitted too, it is not as though I believe the answer is to be found elsewhere than in the fullness of Christ, Who is always available to me in the fullness of His Church. If you care to unpack any further connections you were making here, I’m glad for you to do so. Any hand, heart, word or thought outstretched in blessing, becomes one! So thanks again! P.S. I think the quote of the Desert Fathers from Fr. Stephens’s next post actually provides a great deal of the answer (in terms of practical spiritual discipline) to the questions I was asking, and his previous post “It is But a Small Thing,” is another important piece of that answer. I thought this might be fitting for “cave-dwellers in the world”. St. Poemen – A man may seem to be silent, but if his heart is condemning others, he is babbling ceaselessly. But there may be another who talks from morning till night and yet he is truly silent, that is, he says nothing that is not profitable.